I’ll be the first to say that ME3’s ending left a lot to be desired, especially pre-Extended Cut. However, most of the complaints were pretty childish. On the whole, they seemed to boil down to just not liking the ending. They wanted it to be happier. They wanted to have more choices. They didn’t want Shepard to die. They wanted to defeat the Reaper juggernaut without any negative consequences to their physical health or moral code, as though one can stop eons of annihilation without getting one’ s hands dirty. They just wanted something else. Although it seemed like most people wrote an ending in their heads and couldn’t handle anything else, there are, in my mind, two very compelling complaints about Mass Effect 3’s ending. The first was my biggest issue – It never felt like the series concluded. It just…ended. There was no explanation for how the Normandy escaped. No epilogue for the characters with whom we had spent 350 hours. Just a cutscene of a colored shockwave and a Buzz Aldrin cameo. Who cares about the story? That’s bad storytelling. But, as eloquently stated in this article, the larger problem was that it “interfered with the trilogy’s most basic assumption: that you can build the story the way you want to.” For three games the player had been building their Commander Shepard. Then, when it mattered most, they removed the “paragon/renegade” choices the entire series had been built upon. A better ending would have taken away the final choice. Your earlier decisions create your ending. Your Shepard was a paragon? Sacrifice self to unite all life in the galaxy. Renegade? Assume control of the Reapers and do what you want. In between? 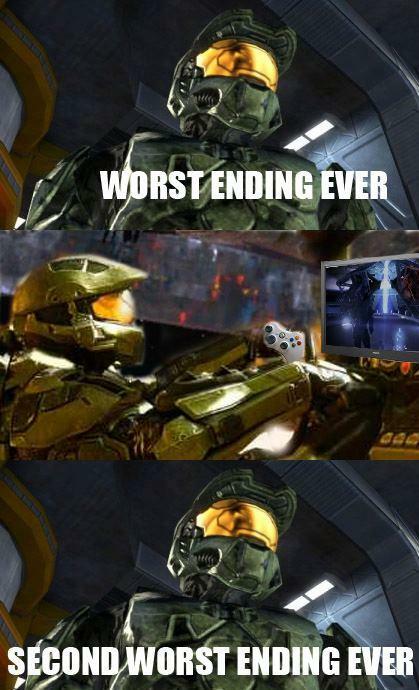 Destroy the Reapers, but the cycle continues. Throw in some shades of grey and you’re set. The relative haste of ME3’s ending made it clear that it was never meant to be our last impression of the Mass Effect universe. The appeal of Mass Effect was never in the gameplay or the story, but rather in the universe and the characters. As such, Bioware’s Citadel DLC was about as perfect an ending as could be imagined. We got a fun little adventure, which reinforced the themes of teamwork and cooperation that dominated the narrative from your first recruitment mission in Mass Effect. Better still was the the “party,” which was an impossibly beautiful sendoff to the NPCs that had become so much more than that throughout the series. 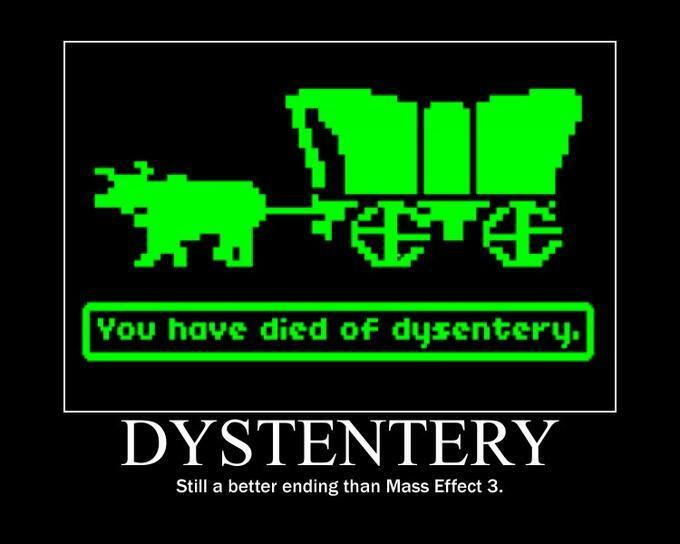 As for my own issues with Mass Effect 3’s ending, I got over it. As much as I wanted the games I loved so much to be perfect, or at least perfect-to-me, it’s not my game. It’s not my story. It’s not my universe. 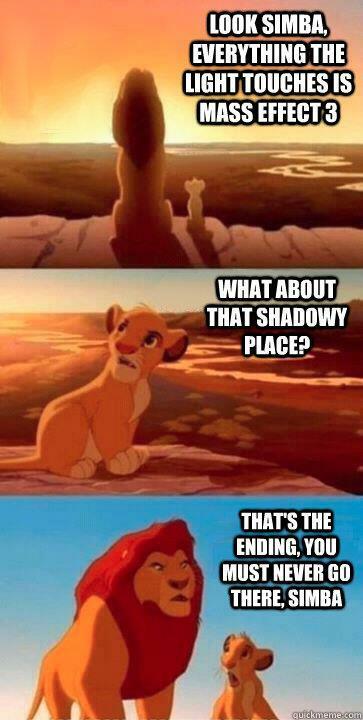 I’m just visiting. So even if they messed it up, it was theirs to mess up. The Extended Edition helped a lot too. It filled in most of the the narrative gaps left by the writers and gave us a semblance of closure for the characters we had come to know and love. That’s really all I asked for in the first place. Let me put it this way. The first time I finished the game, the Extended Edition did not yet exist. I was extremely underwhelmed. 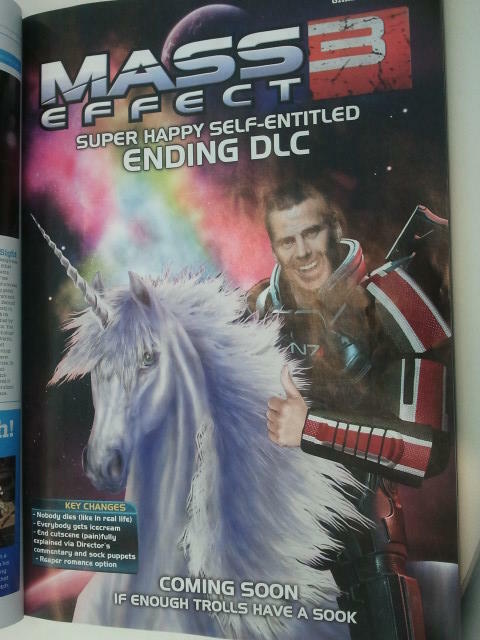 This time, playing from Mass Effect through ME3 with the Extended Ending, I experienced no disappointment. That’s damn impressive. The tentatively labeled “Mass Effect 4” will be coming out in a year or two. When I’m done with that, I’ll give the original trilogy a third go-around. I’m looking forward to my renegade female Shepard. This entry was posted in Video Games and tagged Citadel DLC, Endings, Extended Edition, Gamer Entitlement, Mass Effect, Mass Effect 2, Mass Effect 3, Mass Efflections by Rites of Patches. Bookmark the permalink. Yeah, most of the ending complaints had to do with the lack of respect for choices. Up until the ending, choices actually had effects on gameplay. Kaiden Alenko could be a friend in all three games who eventually winds up with Shepard…unless he’s killed in the first game. Wrex could have a huge impact, or maybe not. But your actions actually had effects that were felt throughout the game, with a minor character who helps you in the 3rd game only surviving it if you happened to do a very minor favor for another minor character way back in the 1st. It felt more alive like that, and helped get players invested. But none of that matters in the original ending. Haha. Yeah, those were definitely my feelings as well. If you are ready for some good news, it seems like Bioware has taken some of the criticisms to heart. The latest Dragon’s Age game had a pretty major plot point where two of your comrades were being considered for a very important position. The awesome part was that you never picked one or the other. You could choose to support one, but it was mostly your earlier decisions and dialogue choices that determined who got the job. Now, granted Dragon’s Age can just build itself forever and never has to “end” in the same way Mass Effect did, but I thought that was a much more natural, meaningful way of handling endings.